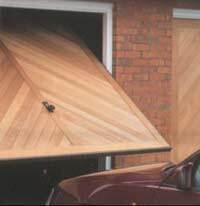 A tilting door can be clad in any material you specify..
Tilting type doors are made of one big panel that "tilts" from the top backwards into the garage. They have been around for a long time and are particularly useful for low overhead room garages and for people who wish to decorate individually. 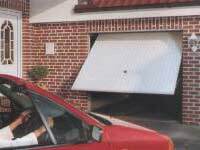 Please view the automatic opener page for Tilt-a-doors. Pirie Enterprises has been manufacturing Tilt-up doors (the brand was Tilt-a-doors) on site for over 25 years. I know that because that's what this webmaster was doing as a holiday job 25 years ago! They are made from a steel frame and can be clad with any materials you wish from aluminium sheets to western red cedar boards. one so it matches the fencing.